Kris Lloyd, cheese maker at Woodside Cheese Wrights up in them thar Adelaide Hills has won (again) a gold medal at this year’s World Cheese Awards. 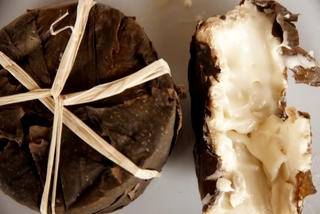 This time it was her Vigneron (pictured above), an oozy, washed rind, goat’s milk cheese wrapped in vine leaves, that walked off with the honours. Woodside currently make around 25 different cheeses from cow’s and goat’s milk. All are made from pasteurised milk – obligatory in highly risk-averse Oz, tho’ – curiously – raw milk cheeses may be imported. Kris comes from a marketing background. When she took over at Woodside about a decade ago, they already made 4 or 5 types of cheese but were struggling. Kris’s idea was to improve things (both the product and the bottom line), to which end she set off on a European cheese tour (Italy, France, UK) to see what they were up to. She came back inspired (“in a ridiculous frenzy” are her words), and then set to in the dairy. 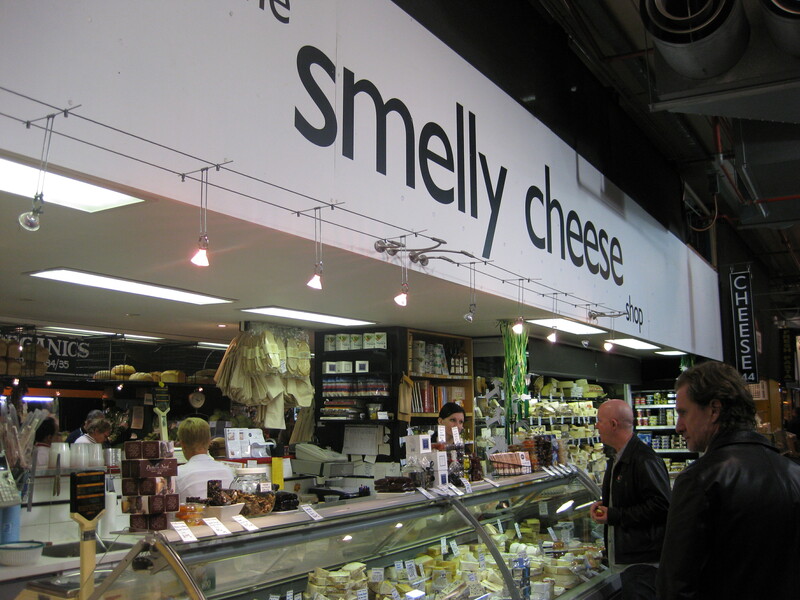 I first tasted Woodside cheeses at the deliciously named Smelly Cheese stand in Adelaide’s brilliant food market. I’d just finished my book on Swiss farmhouse cheeses and, curious to see what they could do Down Under, made a date to meet Kris downtown. She wheeled in a suitcase filled with cheesy samples and threw it open with a flourish. Seated in the hotel lobby, oblivious to the suspicious sniffs (or envious gaze?) of fellow guests, we worked our way through a selection of 8 out of the 25 cheeses currently made: Grace (bloomy rind, goat’s milk); Monet (soft, fresh goat’s cheese, a picture – of course – rolled in thyme and edible flowers); Edith (bloomy rind, goat’s milk, ashed, named after the original cheesemaker at Woodside), the prize-winning Vigneron (soft, washed rind, goat’s milk), Etzy Ketzy (50-50 cow’s and goat’s milk, washed rind); Pompeii (semi-hard, cow’s milk with a layer of ash in the middle, cf Morbier); Harvest (semi-hard, goat’s milk, gently sagging; and Figaro (semi-hard, goat’s milk, washed rind). Woodside make fine products with considerable skill, age them decently and give them plenty of the TLC that good cheese needs. For pasteurised cheeses, they’re pretty darned good. But coming from Europe, particularly Switzerland where almost 80% of cheese is made from raw milk, I caught myself wondering how much more depth of flavour they might have if they were allowed to be made with good, wholesome, raw milk, instead of pasteurised. Australia’s raw milk ban seems daft for all kinds of reasons, not least inconsistency. If raw milk cheeses are so hazardous to human health, how come they can be imported? Slow Food Oz (ably abetted by cheese gurus like Will Studd) is on the case: see here for an update on their campaign for the right to produce and consume Australian-made raw milk cheese.